Danny Batth has been Wolves captain for most of this season, taking the place of Sam Ricketts. Wolves captain Danny Batth was proud to be part of the celebration of Sir Jack Hayward's life as a packed Molineux said farewell to the former owner. Sir Jack, who owned Wolves for 17 years before selling to Steve Morgan for just £10 in 2007, passed away last Tuesday. 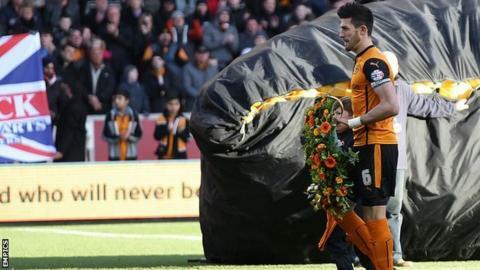 Batth and visiting Blackpool captain Tony McMahon both laid wreaths prior to Saturday's 2-0 home win by Wolves. "It's a shame to lose someone like Sir Jack and the community came out in force," Batth told BBC WM 95.6. "Fans and players had a big coming together and the football was put to one side for a moment as we all paid our respects. Wolves last suffered defeat in the Championship when their 2-1 reverse to Bournemouth at Molineux in December ended a run of five straight losses. Kenny Jackett's side are now unbeaten in six league matches, and have risen back up to eighth in the Championship table, a point outside the play-off places. "Everyone heard the support to what a great man and what a service he's done to the club and the local community as well. "The moment when the wreath was laid was remarkable and fitting for what he deserves." Fans spelt Sir Jack's name out in the stands and observed a minute's applause prior to kick-off. The victory over the Championship's bottom club capped an emotional week for Wolves. "It's not always easy playing a team down the bottom," said academy graduate Batth. "The pressure was on us to take the game to them as they're looking to nick one at the other end." New signing Benik Afobe made an instant impact after capitalising on a Blackpool defensive mix-up to score on his debut. "He did excellently," added 24-year-old Batth. "It takes the burden off Nouha Dicko. The two of them linking up is something fans can be excited about."